For the first time the world agreed that youth empowerment is a way to deliver on the Sustainable Development Goals (SDGs). This presents enormous opportunities and expectations on young people. For the first time the world agreed that youth empowerment is a way to deliver on the Sustainable Development Goals (SDGs). This presents enormous opportunities and expectations on young people. How can the UN support, empower and prepare youth to be the driving force for the SDGs? In Asia and the Pacific, the United Nations Volunteers (UNV) programme, jointly with the United Nations Development Programme (UNDP), are developing a regional partnership with and for youth to deliver on the SDGs by 2030. In March 2016 we asked young change makers in the Asia and the Pacific region to send us video stories that articulate their vision of the future, along with examples of volunteer actions they are taking to make societies more inclusive and peaceful. An amazingly diverse group of 19 extremely brave young people from Asia and the Pacific were selected, and their work was an example of the great capacities of this generation. Why? Some of these young people have learnt sign language to be able to work with youth with disabilities, and one of them created the Youth Diversity Alliance at the age of 22 in Indonesia. Another, amidst all the country’s challenges, started the first-ever food bank at the age of 25 in Vietnam to fight poverty and contribute to sustainable consumption. And finally, a young woman living with HIV in Nepal empowered young populations to raise their unheard voices, providing them with a platform for a strong unified voice. 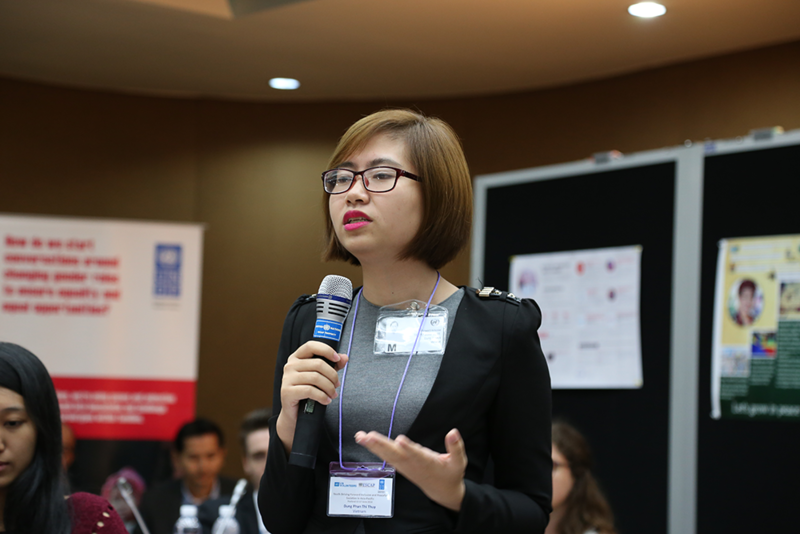 We gathered this group for the first workshop “We Are 2030: Youth Driving Forward Inclusive and Peaceful Societies in Asia-Pacific” in Bangkok in June 2016. Through youth-led sessions on regional development challenges, conflict prevention and inclusion, the group agreed that through volunteerism young people can achieve more and “leave no one behind”. Some members realized only at the workshop that they are in fact volunteers in everything they do as social advocates and activists, but there is still a lack of skills-based volunteerism, a lack of understanding of volunteerism in the region, and a need for cross-border volunteer exchanges, for “offline” impact of volunteerism and for better measuring of volunteer activities. The workshop culminated with the unquestioning willingness of youth to work together on difficult topics related to inclusion. It was clear that these young people were demanding a space for regional action, and UNV and UNDP welcomed it and will continue to provide support. In the presence of numerous partners and supporters, the Regional Asia-Pacific Youth Network was launched. Young change makers chose “2030 Youth Force” as an empowering name for the network. Armed with knowledge on inclusive and peaceful societies, they presented regional and country-level youth-led activities targeted at the SDGs. As a first step and in order to raise awareness and attract more young people to this movement of inclusion and change, the group plans to launch a massive campaign in social media under the hashtag #sendloveON, addressed to other young people in the region to act in their communities and share stories of change. My greatest learning from the workshop was that young people need a common space and opportunities to drive the SDGs in the next 15 years, and they have all the skills and capacities to do so. Inviting them to be at a table to take part in discussions of national development plans or localization of the SDGs is all that it takes. Emiliya Asadova is the UNV Regional (Asia-Pacific) Youth Programme Specialist in Bangkok, Thailand.